Viking Invasion – a huge celebration of music and musicians from the Nordic Region. Don’t miss Eva Thorarinsdottir playing the Grieg C Minor Violin Sonata in Viking Virtuosity. Folk – concerts replete with folk-inspired classical music. Don’t miss the Festival Ceilidh or our artistic director, Libby Burgess, playing the Brahms G minor Piano Quartet with its wild finale in Raggle-Taggle Gypsies. Poets’ Corner – events focussing on poets and poems which have sparked some great musical creation. Don’t miss Larkin’ About in which local actor, Malcolm Tomlinson, stars alongside festival musicians. Organ recitals – two international recitalists and three highly talented young organists join the team this year. Don’t miss Gunnar Idenstam’s recital in Beverley Minster or Nicholas Wearne’s recital in Selby Abbey. Finzi Day – a whole day of the festival steeped in the music of Gerard Finzi, culminating in the world premiere of ‘Two English Folksongs’ by Diana Burrell commissioned by the festival and funded by the Finzi Friends. Don’t miss Libby and the festival’s entire string team playing Finzi’s incredibly beautiful Eclogue in the coffee concert, Stories and Sagas. Plus so much more including Westwood Resounds (our lively free concerts for children and families) and the chance to sing your heart out in The Easter Singunder the baton of the inspirational Joanna Tomlinson. Seats are still available for most events so book your tickets and passes now to avoid disappointment. New Paths celebrates the town it is proud to call home with its biggest ever event, A Musical Takeover of Beverley, an entire day of free music all over the town on Saturday 7th April. We are delighted to welcome a very special four-wheeled guest to town for the day, the 1950s iconic Beverley Bar Bus, with its specially curved roof (to fit through the North Bar)! 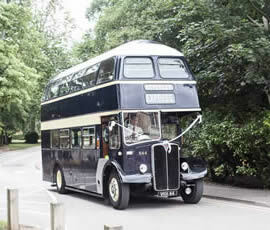 Hop on board the vintage bus for free journeys to some of our beautiful venues in Beverley. Festivalgoers will also have the opportunity to meet and hear musicians on the bus. Keep your eyes peeled for the bus timetable which will be published in due course. Many festivalgoers will follow the Takeover trail on foot with town mascot, Bertie Beaver. 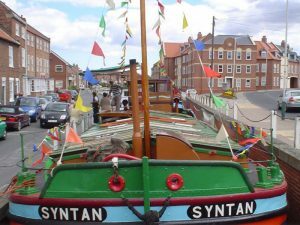 Mermaid, the smallest vessel in the Beverley Barge Preservation Society’s fleet, will also be making free short trips up and down the beck during the day! Prior booking is recommended (see page 35 of the brochure for details). At 7.00pm our party night at the Memorial Hall kicks off with a pie and peas supper. This is followed at 7.30pm with a folk- and dance-inspired concert. And then the Ceilidh begins at 8.30pm. We welcome ceilidh band Triple Scotch from Manchester – feted as the finest in the land. Italian lunch at Capri in Selby at 13.30pm on Wednesday 4th April. Soup and a sandwich lunch at the East Riding Theatre café at 13.00pm on Thursday 5th April. Afternoon tea at the Tea Cosy at 16.00pm on Thursday 5th April. Supper at Carluccio’s at 18.30pm on Thursday 5th April. Ploughman’s lunch at the Minster Parish Hall at 13.00pm on Saturday 7thApril. Pie ‘n’ peas supper at the Memorial Hall at 19.00pm on Saturday 7th April. Sunday Roast at the Monk’s Walk at 13.30pm on Sunday 8th April. Reserve your place(s) at these food and drink events by emailing admin@newpathsmusic.com. 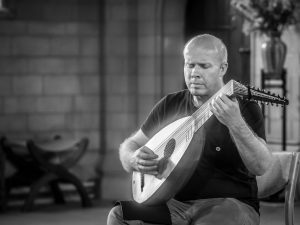 There is also an opportunity to join Founder Friends and Patrons of New Paths at a secret location in Beverley on Wednesday 4th April for an informal reception at which world-renowned lutenist Matt Wadsworth plays in an intimate and social setting. For details of how to become a Founder Friend of New Paths, see the support page on our website here. 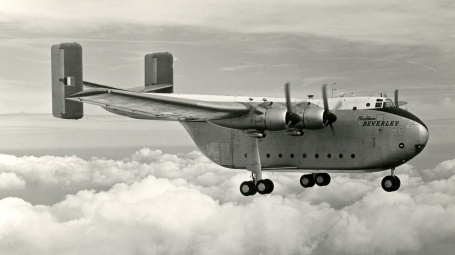 “By no means a pretty aircraft”, the “ungainly but highly effective” Beverley (pictured) was a 1950s heavy transport aircraft with a wingspan of some 162 feet and a capacious hold. 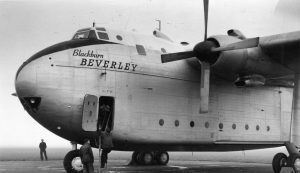 Built by Blackburn Aircraft in Brough and named ‘Beverley’ by its workforce (after their county town), many of the craftsmen at the factory doubted if it would ever leave the ground! Some people may’ve thought the same thing about New Paths, but thanks to the generosity and support of our wonderful Founder Friends, Patrons, and Volunteers, we are absolutely thrilled to be able to present the third New Paths festival, a whopper comprising over 40 events! Join us this Easter for a musical expedition in Beverley.